Returns are an inevitable cost of business for eCommerce stores. That’s why you need to take your return policy seriously. You don’t want to have a policy so strict that it makes customers wary of buying from you, nor do you want an overly generous policy that encourages too many returns. Either would cost you money. According to the National Retail Federation, 10 percent of all products purchased online or in brick-and-mortar stores in 2017 ($351 billion worth!) were returned. By 2020, return deliveries are estimated to cost $550 billion. 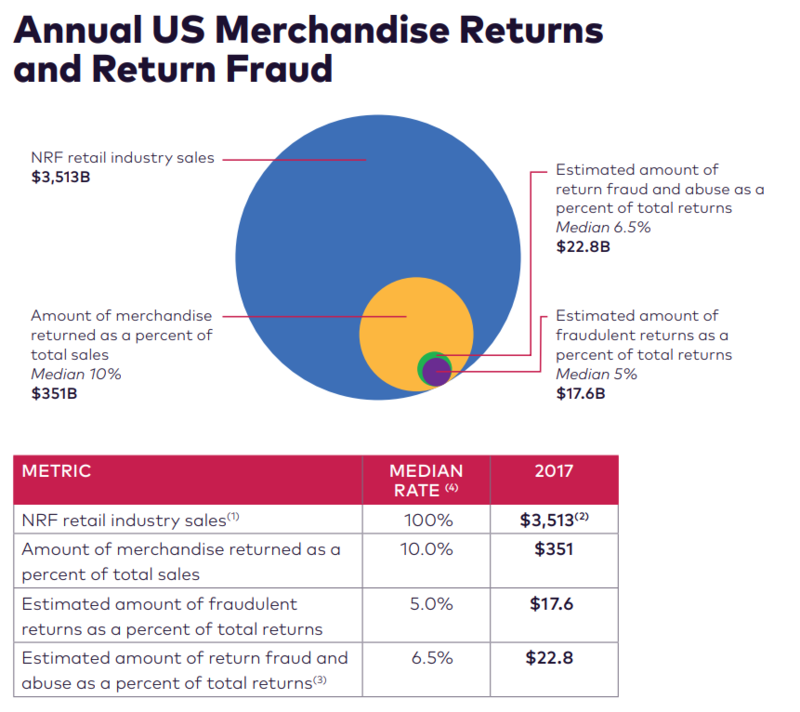 Abuse and fraud make up a rather large portion of those returns—$22.8 billion in 2017 according to the NRF, and your return policy can help you avoid being a victim of those sort of issues. 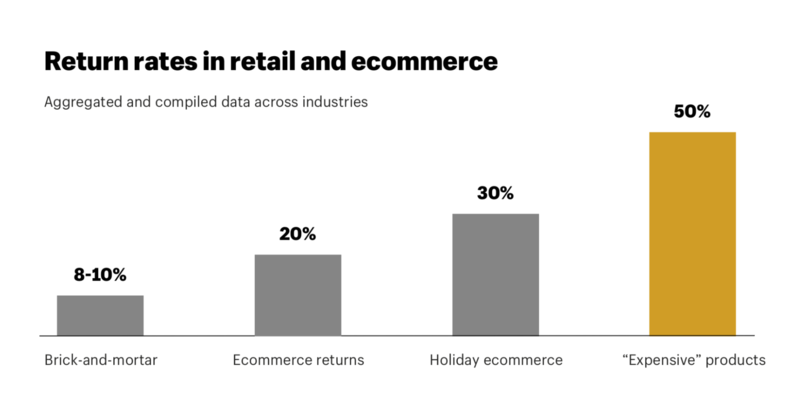 When you look at eCommerce only sales, the return rate is even higher, especially during the holidays and for expensive products (according to data from Shopify). When people can’t touch and feel their products before purchasing, they’re more likely to make the wrong selection. (This explains why people are willing to pay more for items to have the option of returning them). Creating a comprehensive return policy helps build trust with your customers. It tells them that you understand that returns happen and you have a process in place to help them. But it also helps protect your business by laying out expectation about when you accept returns and how they work. After a successful return (whether it’s a straight refund or an item exchange), customers learn to trust your brand. They realize that you care about their experience. They know they can shop without worrying they’ll get stuck with something they don’t want, which makes them more likely to buy again the future. Around 95 percent of customers will make additional purchases if the return experience was easy. This means that your return policy is a key tool for fostering customer loyalty. So how do you design an eCommerce return policy that pleases your customers while at the same time protects your interests as a retailer? An estimated 67 percent of shoppers review your return policy before making a purchase, so it shouldn’t be hard to find. If your customers can’t find it quickly, they might assume it doesn’t exist, which could make them nervous about purchasing from you. 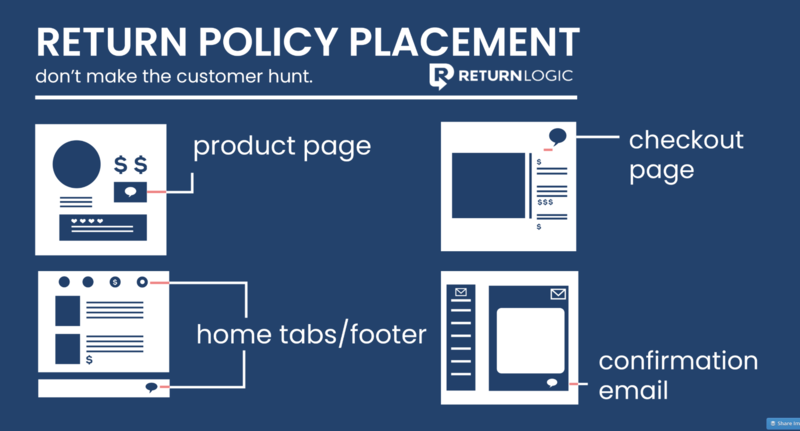 Naturally, you’ll want to create a dedicated page on your website for your return policy. Include a link to it in your footer so it’s available on every page. If your return policy is a big selling point for you (perhaps easy returns are one way you separate yourself from competitors), consider placing it in a prominent location. You could include your policy copy or a link to the policy page on your homepage, in the sidebar of your category pages, or right in the header so it’s present on every page. It’s even a good idea to throw a link to your eCommerce return policy at the bottom of your email signature so every customer you speak to can access it. But they can only solve their problem if you make the process clear, so it’s important to keep your return policy simple. Your customers are probably already annoyed that they purchased the wrong item or received an item with an issue (defective, broken, etc.). Don’t make them go through complex steps just to get a replacement or refund. According to a recent study, 91 percent of consumers never read legal agreements. This study was about privacy policies and terms of service, but the numbers are striking and relevant here. While most consumers will seek out your return policy before buying, they won’t stick around if you make it overly complex and hard to read like those 20 page software terms of service documents everyone agrees to without reading before installing app updates. Long, complex updates won’t get read, and if your customers don’t understand your return policy, it will just create headaches down the road when they try to return something. Furthermore, 96 percent of customers who go through high effort experiences do not become repeat customers. 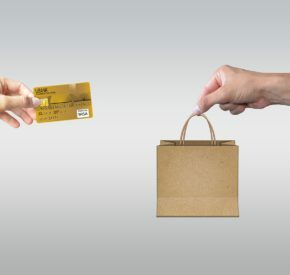 You can build the foundation of loyalty by making your eCommerce return policy easy to understand and effortless to follow. How do you make it simple? 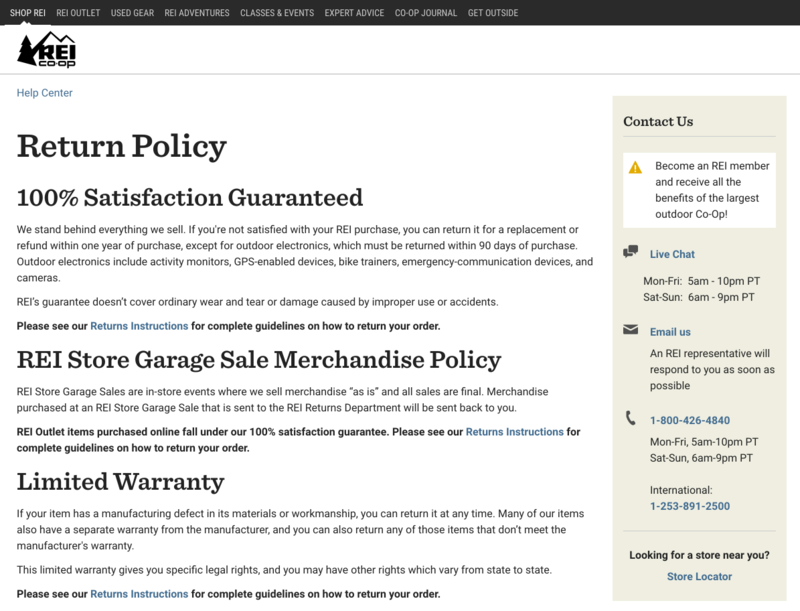 Use straightforward language on your return policy page (no legalese). Display your policy as bullet points or steps. Avoid dense paragraphs. Tell customers what they can expect and when they can expect it. List steps chronologically to help customers understand the process. Include visuals, like infographics or video, that explain the process succinctly. 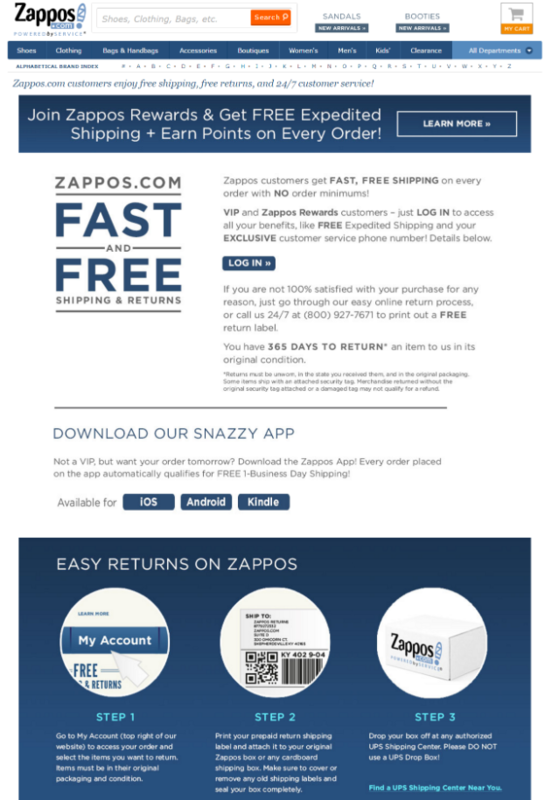 As an example, check out Zappos’ return page. Notice how the terms are simple and clear. At the bottom, they give you an overview of the process in three easy steps with clear visuals of what you should look for. One way to make returns simple for everyone is to automate the process from beginning to end. Don’t make your customers call or email you to manage their return. Give them a way to request, manage, and track a return from their account on your eCommerce shopping cart. Some retailers even include prepaid return labels in the shipping box by default. You should also send customers emails along the way to update them on the status of their return. Notify them when you receive their item, when you issue a refund, or when the replacement item is shipped. No matter how simple you make it, returning products is always an errand. No one enjoys doing it, especially when they have to repack the box and wait for it to ship to you and back again. You’ll compound that frustration if you add a return or restocking fee. It makes customers feel punished for purchasing the wrong item. Ideally, you want to eliminate all charges associated with returns, including postage. According to a survey by Invesp, 79 percent of customers want free return shipping. Customers who receive free shipping on returns increase their spending by 58 percent to 357 percent. Instead of charging shipping on the return, calculate your typical shipping fees for returned items, and your normal rate of returns, and build that cost into your product pricing. This will spread the expense out among your customers and prevent anyone from feeling penalized. This is the part where you really have to think. Like most eCommerce brands, you probably have to place some restrictions on returns. Brainstorm all the types of items you don’t want back. For instance, you might prohibit the return of food products or clothing that’s been worn. Next, consider the process of arranging a return. What steps do customers need to take? How long will it take you to send out their new product? If they want a refund, how long will it take you to issue money back to their credit card (or ApplePay account or PayPal, etc.)? Err on the side of caution when laying out the process. If you think it will take you five days to process the return, tell them it will take 10. This way you will almost always exceed expectations, which reflects positively on your brand. How long is your return window? Do you allow returns for two weeks? 30 days? 60 days? Longer? The answer will vary depending on things like your margins and product cycles. If you sell a product that people tend to replace every few months you might offers a shorter window than a retailer that sells a product that typically lasts for years. Consider adjusting your return window during the holidays. It’s a busy time of the year for many people, so it can be harder for consumers to find the time to deal with returning items. Plus if a gift giver buys a gift at the beginning of December, the window may be over by the time the recipient receives it. Also consider whether you treat refunds differently from exchanges. For example, some retailers will only process refunds for broken or defective orders, but will process exchanges for any reason. The correct answer will vary based on your needs and what your customers want. Similarly, think about whether your policies change depending on the reason for return. Do you have a different process for defective items than you do for when the customer simply changes his mind? REI’s return policy (above) is both simple and comprehensive. It clearly defines what is covered and what isn’t, how long customers have to return, and links to a detailed process for returning either by mail or in-store. They also include multiple ways to contact support displayed prominently right on the return policy page, which is smart. Customers will never feel like they can’t find the answers they seek. Don’t be afraid to amend your eCommerce return policy over time as you learn more about your customers’ needs and your own ability to adhere to the policy. If you make a promise you can’t fulfill, it’s better to change the policy than fail to meet your own standard. The point of your return policy is to keep your customers happy. Don’t be afraid to go beyond your policy. You don’t have to lose money to please customers, but don’t be afraid to go beyond your policy to keep a them happy. Furthermore, it’s critical that you never hold the customer accountable for your own mistakes. Don’t charge them for return shipping if you sent the wrong item. Don’t deny their return because the package is torn, unless you made that clear on your policy. Remember: you never want to lose a customer over a single sale. Most importantly, be courteous whenever you have to work with customers to process a return or exchange. Empathize with their situation. Don’t treat them as burdens. Instead, use these interactions as opportunities to delight your customers and learn more about their needs. Returned items aren’t lost money. They’re investments in your customers’ loyalty. If you give your customers a fair, reasonable eCommerce return policy, they’ll reward you with future purchases.